Registration for the Eclipse Testing Day is now open at eclipsetestingday.eventbrite.com. 2013 is the fourth consecutive year of the Eclipse Testing Day - a not-for-profit, full-day event dedicated to topics in testing. The event is organised by BREDEX GmbH and the Eclipse Foundation. This year, the focus is on mobile testing. 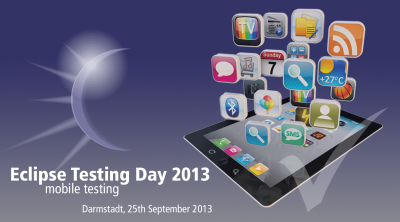 The Eclipse Testing Day 2013 will take place on 25th September 2013 from 8.30am to 5pm, followed by an evening reception. As the event is not-for-profit, the ticket prices are reduced to their minimum, and cover the costs of catering and room rental. Eclipse Foundation members : 30€ net. We also have a limited amount of student tickets for 28€ net. The day will begin with registration at 8.00 am. Testing of Mobile Solutions: Old wine in new skins? We are pleased to include a panel discussion again this year. Given the amount of mobile platforms and devices, and the speed of development in this area, how can we ensure that our applications are tested in a representative manner? What kinds of projects are suited to a certain strategy, or what strategies must be avoided by some projects? We've chosen the panel members so that they represent some of the options available for mobile testing - using open device labs, crowd sourcing, cloud testing and inhouse testing. There will be an opportunity during registration to enter questions for the panel, and, of course, plenty of time during the discussion. As in previous years, the Testing Day will be supported by sponsors and supporting organizations. There are various options for sponsorship of the Eclipse Testing Day 2013. See the Sponsoring Page for details. The Eclipse Testing Day is made possible by sponsors and supporting organizations. If you would like to sponsor or support, see the Sponsoring Page for details. BREDEX GmbH is software development and consulting company based in Braunschweig, Germany. Alongside individual customer software development for desktop and mobile applications, they are also behind the Jubula Functional Testing Tool Project at Eclipse and GUIdancer, Jubula's commercial counterpart. BREDEX GmbH became strategic members of the Eclipse Foundation in 2010. Díaz & Hilterscheid offers worldwide professional consultancy services and IT solutions in business-related and technical projects within the financial sector and industry. In the areas of financial services, IT management and quality services and computer law, our all-encompassing process covers everything from the analysis to the design and the release into production. As an accredited training provider we give staff training courses in several languages on the subject of quality assurance. The conferences organized by Díaz & Hilterscheid are a meeting place for international visitors, exhibitors and renowned presenters from the industry sector. The Testing Experience magazine has hundreds of thousands of readers worldwide. SOASTA is our beer sponsor for the Eclipse Testing Day. Developer Garden (www.developergarden.com) is the developer ecosystem of Deutsche Telekom. It is the central hub for software developers and business partners to easily access advanced technologies and core services. Developer Garden offers a broad product portfolio of web services, tools and APIs (Application Programming Interfaces) for smart and efficient software development. It provides developers, large, medium and small companies of all industries e.g. with new ways to enhance and monitor the quality, security and performance of their applications. Integrating Developer Garden’s services offers infinite ways of unlocking new business potential to drive revenue and customer loyalty while reducing time-to-market. Recurring tasks and processes lead people to take a closer look into a particular problem area. With years of practical experience, we have decided to develop innovative software solutions in such key areas using our expertise. These solutions are tailored to the needs of professional users and help them to work in a more efficient and safer manner. To this end, GFB Softwareentwicklungsgesellschaft mbH, a 100% subsidiary of GFB IT Consulting and Services GmbH was founded. The consulting firm, formed in 1997, has many years of experience in software testing and quality management. Quality improvement through automation. GFB with its standard software Q-up supports the automated generation of test data. Based on a customer-specific test data strategy Q-up realizes time and cost savings for increased data quality throughout the entire life cycle of your IT applications.